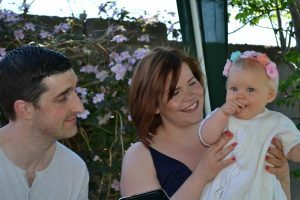 So, what exactly is a Humanist Naming ceremony? A Humanist Naming ceremony is held to welcome a new life into the family, the community and to the world. It is an opportunity to gather together with family and friends to celebrate your child’s birth and, if you wish, to appoint “godparents”. So, it’s like a non-religious Christening? That’s one way of putting it, yes. That’s up to you really. Many families have the ceremony in their home or garden. Others use a community centre or restaurant or a private room in a hotel or pub. I’ve also conducted Naming ceremonies in a public park, at the zoo and at a family activity estate. I will welcome everyone and explain why we are gathered. Typically there would then be contributions from parents, grandparents and others – for example readings, poems, words written especially for the occasion and also symbolic rituals like candle lighting and blanket wrapping. If there are older siblings they might make and present a gift to the baby. You might also have some music, particularly if there are any musicians or singers among the group. There is also a formal naming element and some closing words. Most people appoint “godparents” (also called guardians, guide parents, oddparents) and they would play a part in the ceremony. That said you don’t have to have “godparents”. And what do people usually do after the ceremony? Again that’s up to you. Most would have food and drinks and family and friends would stay around together for a few hours. If there are a lot of children, perhaps activities organised for them. How do I arrange a ceremony? Are you available at weekends? Yes, and most people have Naming ceremonies at the weekend. That said, I am also a wedding celebrant, so I can be booked up quite far in advance particularly in the summer months. Sometimes people would have the Naming ceremony either early or late afternoon so that I can come to you before or after a wedding.